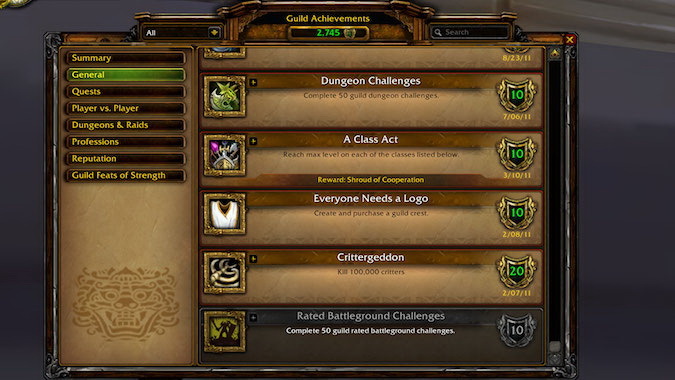 Where have all the guild achievements gone? NEXT | How do you deal with social anxiety in online games? In anticipation of the patch coming next week — presumably followed by Dazar’alor in January — my officers and I were looking at things we could accomplish. We’re not as progression focused as other guilds, and we define “progression” as an amble through content — going here and there in a leisurely fashion. We like achievements. We like seeing them pop up on our screens. It gives us a sense of accomplishment. 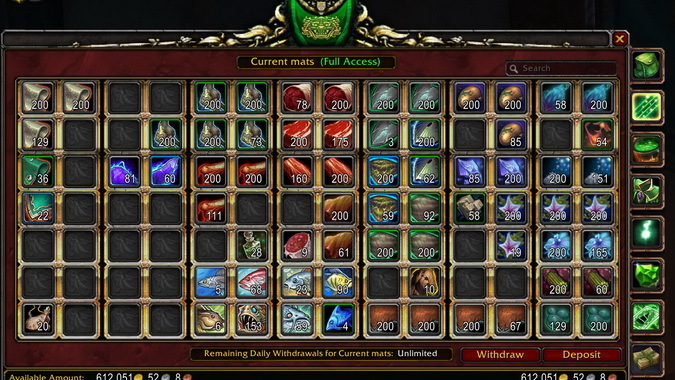 Lately, guild achievements have been whittled down to almost nothing. In my opinion, this is not good. Creating achievements has to be difficult. Some spring organically from content — think reputation, completion, or collection achievements. Others come from accomplishing something within a battle or event — think killing a boss without using a specific attack or killing a boss repeatedly by using a different attack each time. As a player, your options for achievements are vast and varied. If you poke around in the guild achievement tab, achievements are very thin — particularly as we progress through expansions. It wasn’t always like this. When achievements first burst onto the scene, there were hundreds to accumulate. Gathering, crafting, exploration, reputation, and boss-killing achievements meant there was something — other than grinding current content — for guilds to do. My guild set aside specific days to blast through content or spend two hours gathering or crafting. Other achievements — such as Ambassador — had to wait on a guild member, but we were excited for those as much as when we helped a guild member get Sulfuras. 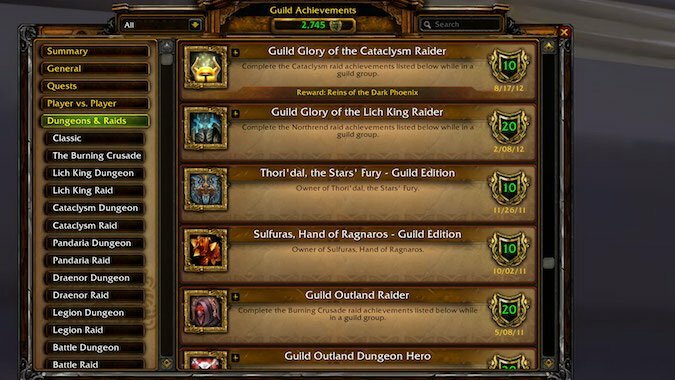 Obtaining achievements isn’t something we do just because we like seeing our guild Achievement Points grow. It’s about community. Several of the best events we had were in the name of earning Crittergeddon. We had a group head to the tunnel at the northwest corner of Eastern Plaguelands — the tunnel with all the spiders and roaches. They ran through that repeatedly, killing every critter. We had another group in the tram at Ironforge. We found the spawn points for the rats and spent an evening making piles and piles of rat carcasses. Both times, it was exciting to watch the total go up and up and up as we crept closer to 100,000 critter kills. It was a great way to involve players of all levels in a guild event. Currently, the only new guild achievements are for killing a final boss in a raid. 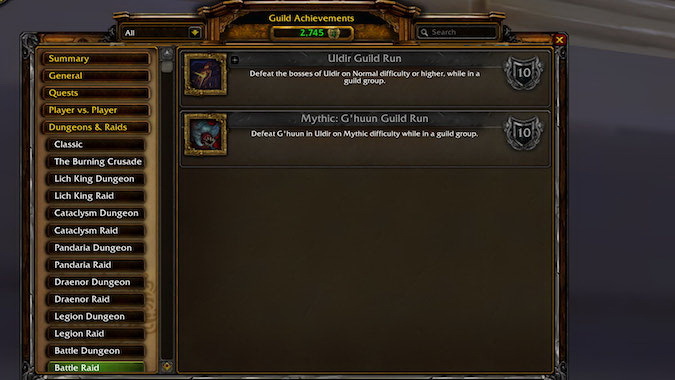 If you aren’t a PVP-focused guild, you’ll have a bunch of the PVP achievement unfinished, too. We’re working on Creepjackers at the moment. Because PVP is not what we mainly do, PVP-centric achievements are liable to never be obtained. We’re not interested in rated battlegrounds. If you like achievements, as we do, looking at what you can accomplish leaves you feeling very sad. I don’t dispute how tough it is to come up with achievements. Yet I can’t help but feel the lack of guild achievements — beyond “go clear all these dungeons in mythic mode and go kill x boss in this raid” — is symptomatic of the lack of attention being paid to guilds overall. If you’ve paid attention to what I’ve written before, you know I’m a big proponent of the guild structure. I also feel the lack of attention to things such as the bank and — most importantly — the guild management panels, is indicative of an “out of sight, out of mind” attitude toward guilds in general. You don’t have to be in a guild to get top-of-the-line gear. The ability to make a community of like-minded people means you can run solo through the game and still get the rewards you might want. But guilds have been the backbone of the WoW community, and little things — like a lack of achievements — say this backbone is forgotten. Gather 100,000 items from Kul Tiras and Zandalar. Craft 500 Battle for Azeroth items of blue quality or higher. Kill the weekly rares while in a guild group of 5 or more. Complete 200 Island Expeditions while in a guild group. Defeat the boss of Freehold while everyone in the group is a pirate. Let’s look further afield. Years ago, my guild came up with an idea for a guild blimp. At the time, sharding did not exist and the use of blimps filled with guild members would have caused serious lag. Now, with sharding, guild blimps could ply the skies above capital cities. We came up with not only what materials would be needed — and we went backwards into older content to make those materials relevant again — but also what guild achievements you would get for crafting the blimp. It wasn’t just “Craft a guild blimp.” You got achievements for having more than one person able to pilot the thing or for over half of the group surviving a crash, for example. I look at all the things we do as a guild. We are out and about jumping off cliffs or impaling ourselves on spires because we can. We just finished an event where we got people the Riddler’s Mind Worm. What about an achievement where 3/4 of your guild gets this or another mount which — while it can be obtained solo — goes faster with a group? There are quite a few things guilds do which would lend themselves to guild achievements. I’m feeling the need for more guild love. Achievements are one way to give people a reason to group up and do things together. It’s not enough to defeat Jaina as a guild. We need more. Unfortunately, I don’t think that’s going to happen.